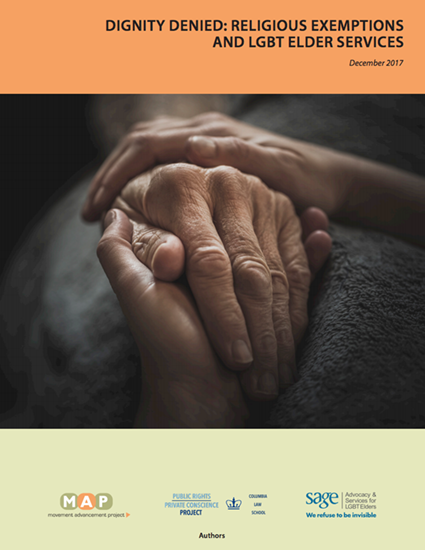 Our Report on denial of services to LGBT elders. Ever-growing religious exemption laws put LGBT elders at increased risk for discrimination. The Movement Advancement Project (MAP), the Public Rights/Private Conscience Project (PRPCP) at Columbia Law School, and SAGE have released this report, which highlights the unique ways in which lesbian, gay, bisexual, and transgender (LGBT) elders are harmed by a growing number of laws and policies aimed at exempting religious organizations and individuals from following nondiscrimination and civil rights laws and policies.